I’ve been asked recently why I haven’t been posting anything on my blog. I was specifically asked why my blog has been silent in regards to Windows 10, apparently I wrote a lot about Windows 8. Well fret no more, not that you have been. I’m collaborating with Ministry Tech Magazine and they are publishing my writings. Ministry Tech Magazine, formerly Christian Computing Magazine, launched today with their new branding and I’m honored to have an article on Windows 10 as their cover story. Check them out. I will still do my best to post here on the blog. I’m sure I can find something to rant about that wouldn’t be appropriate for the magazine but for now if you are looking for tech stuff be sure to visit their site. They publish monthly and their articles can be read online or you can read the magazine electronically online or download a PDF. 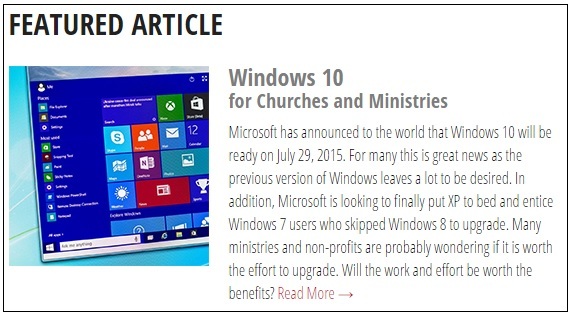 This month’s article is on Windows 10, next month’s will be on Windows 10 licensing and whether Windows 10 is really free or not. Windows 10 will be released on July 29 but it will be slowly so Microsoft servers aren’t slammed with everyone downloading at once. Then on August 1, the final bits will be released to Volume Licensing and enterprise users and the rest as they say will be history. 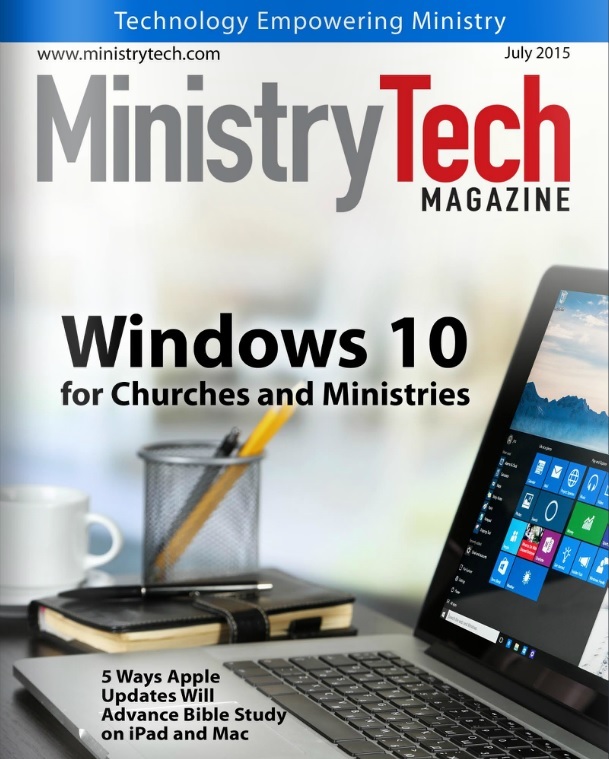 Be sure to send my friends at Ministry Tech Magazine some web traffic love! See you there! Microsoft has announced to the world that Windows 10 will be ready on July 29, 2015. For many this is great news as the previous version of Windows leaves a lot to be desired. In addition, Microsoft is looking to finally put XP to bed and entice Windows 7 users who skipped Windows 8 to upgrade. Many ministries and non-profits are probably wondering if it is worth the effort to upgrade. Will the work and effort be worth the benefits? What about productivity loss due to staff and volunteers learning the new operating system? I think the benefits will be worth the effort and that it will be less painful than you may think. 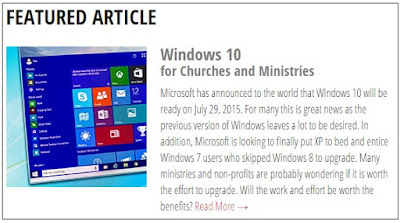 Windows 10 is a huge paradigm shift for Microsoft and for the Windows user base. The first big shift is that this will be the final version of Windows. There won’t be a Windows 11, 12, or 29. Why Windows 10? No one really knows for sure. Perhaps it is because like Star Trek movies only ever other one can be good. Star Trek: The Motion Picture < Star Trek: The Wrath of Kahn. Some say it is because 10 is a nice round number and skipping 9 implies it will be the final version. Others say that the Windows code base refers to Window 9* too much therefore skipping Windows 9 makes coding easier. Another idea, and my favorite, is that seven eight nine. That’s seven ate nine. Despite all the speculation as to why Windows 10 is called Windows 10 the message is clear, no more versions after this. Perhaps Microsoft will gradually drop the “10” and we will just be left with Windows. The reason this is the final version is that there will be no more waiting for features to be released at each Windows version. Instead, new features and changes will be released regularly alongside the current mechanism for security updates and patches. Releasing features on an ongoing basis will allow Windows 10 to update faster and stay current with the needs of its users. Users will be able to decide when new features are applied to Windows and organizations will have control over features rolling out to their end users. The second big shift for Microsoft are the interface changes coming to Windows 10. Windows 8 had a lot of common functionality removed. Many keyboard and mouse users felt forgotten. Microsoft said no one used the Start Menu so it was removed. Fortunately, they have changed course and the Start Menu along with a host of other new features are coming in Windows 10. For some they can’t come soon enough. Here are some highlights of the changes coming. Not only is the Start Menu coming back but also the Start Screen isn’t being totally abandoned. The Start Screen is what comes up when pressing the Windows button in Windows 8 and 8.1. The Start Screen contains Start Screen apps and Live Tiles. I find Live Tiles to be very useful for gathering a lot of information at a glance. In Windows 10, the Live Tiles from the Start Screen will be merged with the Start Menu providing the functionality of both in a single location. Start Screen apps will now run as native Windows apps as opposed to running in a separate, often confusing window. The Start Menu coming back will make the upgrade process much less painful for users currently running Windows7 and will make users running Windows 8/8.1 rejoice. Windows 10 also includes a more flat graphical design. Many of the drop shadows that were removed in Windows 8 are back making it much easier to tell which window is the active or selected window. Of course, many commonly used icons have also been updated. Sometimes these graphical changes can cause user trepidation. I find it helpful to remind users that Recycle Bin is still the Recycle Bin even if the icon looks different. It’s like driving a car, if you can drive one, you can probably drive most of them even if some of the controls are in different places. In addition to the graphics being flatter, the sounds have also been updated to be softer and more soothing. Another new feature to Windows 10 is virtual desktops. Virtual desktops have been around a long time in other operating systems but are new to the Windows world. Virtual desktops allow you to have multiple versions of your desktop running. In Windows now, you may have 40 different windows open but they are all filling up the task bar making it crowded and difficult to find things. With virtual desktops, you can divide them up. One desktop might have a picture of your family along with your email open, a Word document and an Excel spreadsheet. Another desktop might have a picture of your favorite movie and have 3 of your favorite games running. Not only can this be used to separate work from pleasure but also to better organize your applications based on the task you have at hand. Windows 10 also comes with a brand new internet browser. Internet Explorer is dead. While it can still be installed and used, especially for legacy applications, the new browser is called Microsoft Edge and it comes installed by default. Edge does what the name implies; it is there to be an unobtrusive edge around the internet content. It is clear that Microsoft is playing catch up here but Edge does run very fast and could easily become my new default browser of choice. Cortana is also coming to Windows 10. If you play Halo then you know who Cortana is. If you don’t play Halo, Cortana is a built in virtual assistant for Windows 10. She is similar to Apple’s Siri or Google’s Now except that Cortana is more contextually aware. The more access to your personal information you give her the more she can help you plan. The question is how much access will you give her so she can help you out. It is great that she can remind you to get your wife a birthday present and help you leave early to avoid traffic but that means she has to have access to your calendar. Some may not be comfortable with that. Cortana can also help you use your computer hands-free. She can take dictation, and even help you change computer settings. Of course, if you want, she can be turned off. Microsoft has told us that Windows 10 will be free to “most users”. This is rather complicated as while “most users” include those who purchased hardware and activated the version of Windows that came with the hardware it does not necessarily include business or enterprise users. If you have questions ask your Microsoft licensing representative, but don’t’ wait too long as come July 29 lots of business and enterprises will be flooding Microsoft with questions. If you’d like to start experimenting with Windows 10, you can download a copy now at http://preview.windows.com. By running the preview, you can provide Microsoft with feedback as to what you like and don’t like about the operating system. This feedback will help with the continual development of Windows 10. Remember, Windows 10 isn’t going to be released and then forgotten. Once released Windows 10 will continue to evolve. I’m excited about Windows 10. Microsoft seems to have gotten this one right and as end users, we stand to gain a lot.